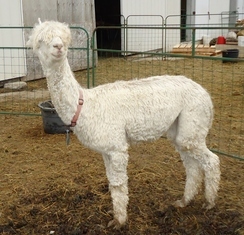 This white Suri yearling female bears evidence to the wealth of strong genetics in her pedigree. Her sire, Pucara Kahuna's Pipeline, is an AOBA Nationals and US Futurity Champion in 2011 in addition to his outstanding show record for 2010. 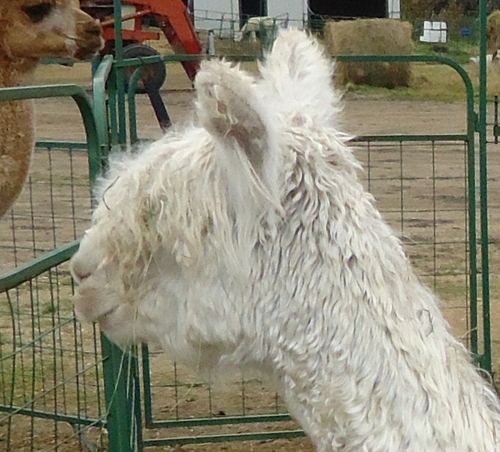 Her dam, Pucara Chachapoya's Bethany was selected for import to Canada based on her examplanery display of Suri characteristics, fleece style and her square frame and correct conformation. Brittany is picture perfect from her beautiful Suri head, down into her silky, lustrous, dense fleece. She is a real eye catcher and will enhance your breeding program for years to come.